The capacity of Ghana’s Navy to monitor Ghana’s territorial waters was this week stretched to its full limit as a group of oil pirates slipped through their fingers leaving behind a vessel load of oil. The pirates believed to be Nigerians were said to have hijacked an oil vessel from the oil rich country and brought it into Ghanaian waters. The vessel christened “African Prince,” belongs to the Nigerian National Petroleum Company (NNPC), which is currently anchored at the Tema Habour Under heavy security. The vessel is said to be carrying in its belly board about 29,000 to 32, 000 barrels (6,000 tons) of refined petroleum. Impeccable security sources told The Enquirer that the pirates who had taken the crew of the shipping vessel led by a Pakistani by name Captain Shahid Siddiqui, hostage managed to escape in a speedboat on seeing personnel of the Ghana Navy approaching their stolen marine vehicle. Interestingly, the navy could not chase them because its boat was not in good shape. 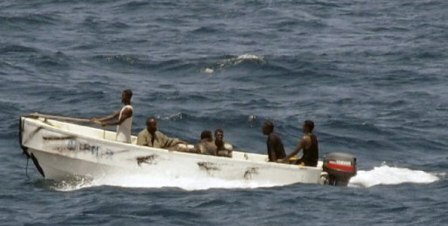 Information gathered by this paper has it that the runaway pirates believed to rebels fighting the Nigerian government at the oil-rich Niger Delta, had navigated the vessel through Cotonou to Togo and finally brought it to Ghana, looking for someone to buy the petrol till they were spotted by the Ghana Navy. Since the arrest of the vessel and rescue of the crew, two Ghanaian owned companies have surprisingly showed up all claiming to be agents of the vessel and its cargo. While one of the companies, Multiplan claims it is an agent for the oil onboard the vessel, Henbic Agency, is saying it is agent for the vessel here in Ghana. But the National Security Council which facilitated the arrest is said to be adamant insisting on thorough investigations to be conducted into the case and backgrounds of the agents before any deal is reached with them, according to the Enquirer. On board the vessel itself, the Navy discovered that one of the crew members by name Ndubusi Okorie, said to be the cook on the vessel was dead and his body badly decomposed. The body has since been deposited at the Police Hospital Mortuary in Accra. Meanwhile there are ‘indications in the Nigerian media that the vessels have been missing and is being looked for by that country’s security.